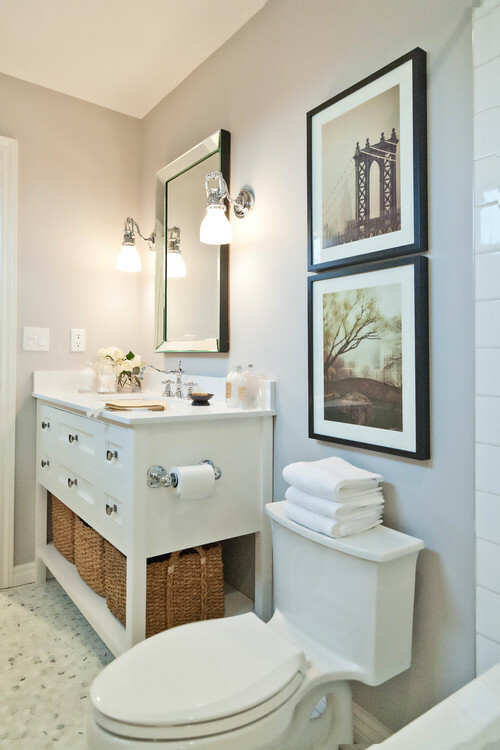 Dealing with a small bathroom might be frustrating because you might not have enough space to put everything away. However, you can still come up with great design ideas that will ensure that you feel great in your bathroom. And, on the other hand, there are a number of tricks you can use to make your bathroom seem bigger than it really is. 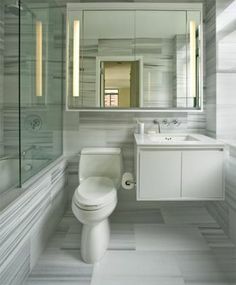 The best practice you can do in your bathroom to make it appear bigger is to use mirrors. But, you should be careful to place them in strategic places, so that they can reflect light in a way that will ensure the illusion of a bigger bathroom. On the other hand, a few decorative mirrors can look nice no matter what, just be sure not to mismatch styles, as it could ruin the whole setting. With the right lighting there is a lot you can do, even in small bathrooms. But, you will have to get more than one lamp installed, because multiple light sources will help in elongating and enlarging your bathroom. Furthermore, you can really set the mood when you are trying to relax after a long day of work, it will help in dimming the feeling of reality around you, so that you can let go of reality, even if for a little. Using colors to change the look in your bathroom might be necessary, because some colors are greater to be used in a smaller one. Furthermore, the accessories you use need to have a certain shade as well, so that you can create more depth. But, be careful not to use too bright colors, or you will create a mess that you cannot enjoy later on. Depending on the size of your bathroom, you will have to change a number of things, and one of the most important ones will be your sink. Though there are many modern ones you can choose form, it is best to stick with an above counter basin as you will have more space to use for storing your things. Moreover, you will not have to worry about pipe rearrangement either, as these are easy to install and rarely require any modification from plumbers. Your only concern will be to pick the right size and color to go with your design. Having a small bathroom does not excuse you from cleaning up. Many bathrooms seem smaller because they are filled to the brim with useless things, which do not even belong in there. De-cluttering your bathroom will be necessary, and you should focus on doing it at least a couple of times a month, so that you have enough space for everything. On the other hand, the more you clean up, the more you will realize just how much space you have that you can use for other purposes as well. Your dream bathroom does not have to be huge, but, smaller ones will have their fair share of troubles you have to take care of before you can really enjoy them. Nevertheless, when you find a good way to ensure that your bathroom is efficient and without any problems to handle all the things there should be inside, you will know that your job is done. But, until then, you need to learn to use available space differently and to install features which can help you gaining more space, so that you do not over-clutter your bathroom. memanfaatkan ruangan yang sempit memang membutuhkan ide yang ekstra keras agar hasil yang didapatkan maksimal dan tetap multi fungsi.